I got not one, not two, but THREE pieces of happy mail today!! I am beyond excited because, even though I own gelatos and Pitt Big Brushes, I don't own these two colors. Can not wait to use them!! So fun!! It's a paint brush!!!!! Aren't you excited? Ok, I am, and you should be. This is not just any paint brush. This is a Donna Downey Paint brush. See the blog post below. I can not wait to paint it and send it back to her. Someday I hope to see it and all the other pretty paint brushes in person. 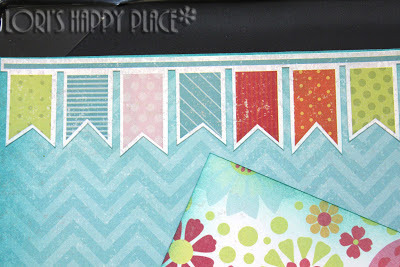 Beyond the happy mail, I also spent the morning giving the blog an updated look. Hope everyone likes it. Keep watching for new things I am designing every day. 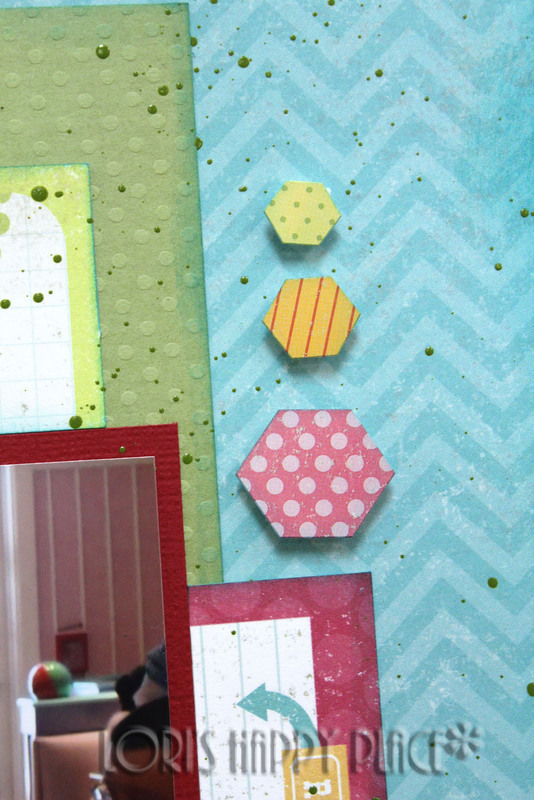 I have in house design team samples that will be done soon for The Scrapbooking Studio in Bloomington, IL. I am also working on some things for myself. Will post more as soon as I get things done. 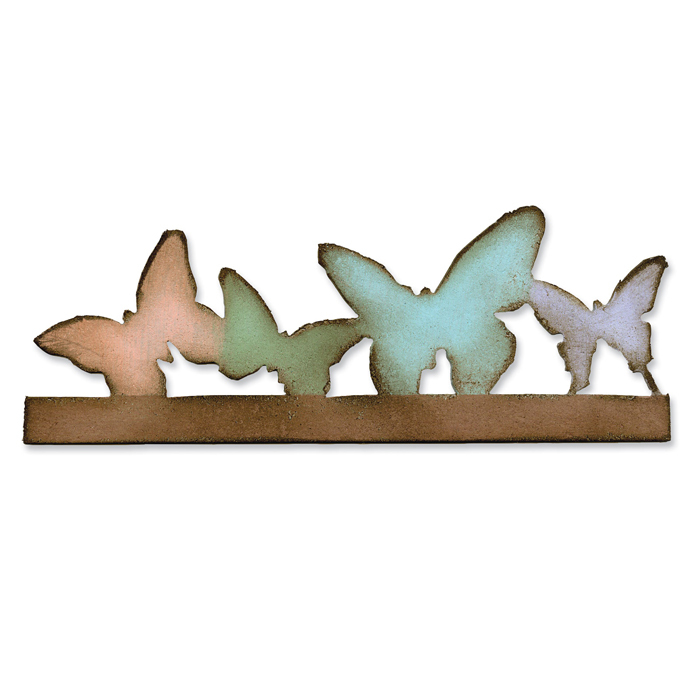 I love this quote .......... "Just like the butterfly, I too will awaken in my own time." I actually designed this a few months ago, but in cleaning an organizing my craft area I found it and in looking in my past blog posts, I realized that I never shared it. I absolutely love how the final piece looked, so I decided to share it even though it is a little older. I started with a 12x12 piece of canvas. The piece I had was very old and I no longer had the packaging to know who made it. 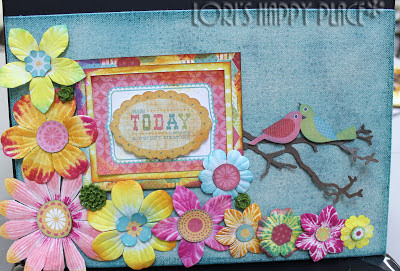 I do know that Canvas Corp does have a 12x12 Canvas Fabric Page. 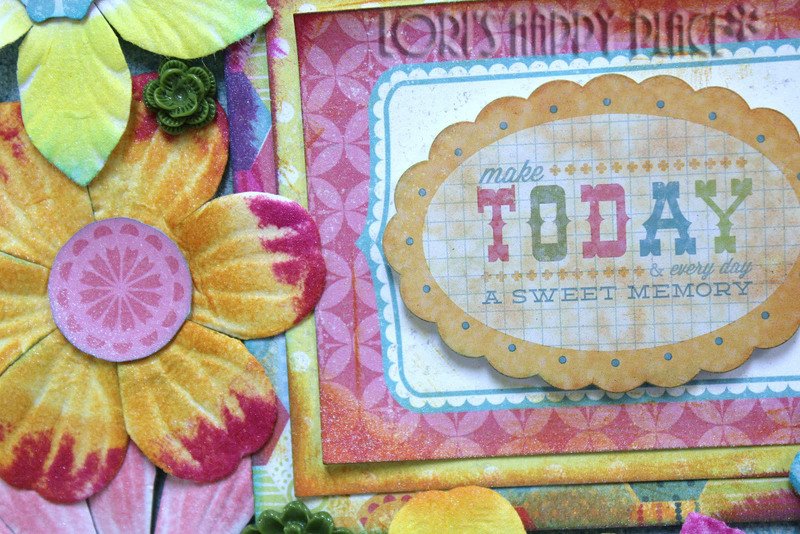 The next step was to use some of my favorite Crafter's Workshop Stencils to add some background texture with a few Tattered Angels Glimmer Mists. I also used some Dyan Reaveley Spray Ink. Dry between layers so your colors do not get muddied together. I also sprayed the entire canvas with a fixative once I was done adding the stencil layers. 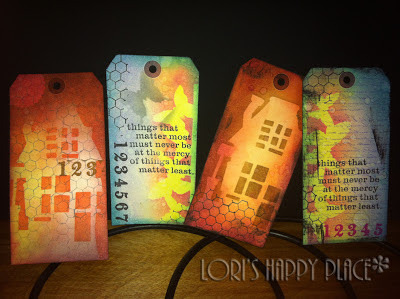 I wrote out the quote with a Tim Holtz Distress Marker onto cardstock and inked the edges. 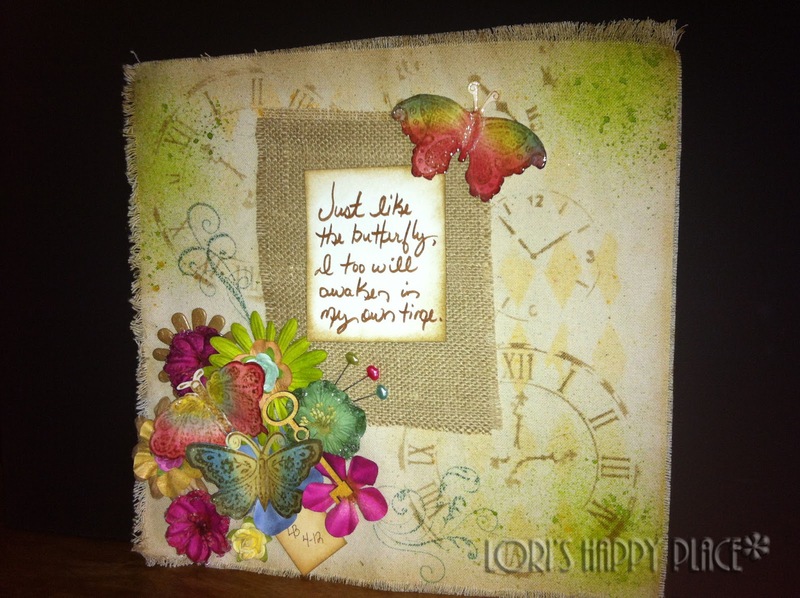 Both the cardstock and the burlap are glued to the bottom canvas with Helmar Quick Dry 450. I plan on putting this canvas in a 12x12 frame and hanging on my wall. I hope this inspires someone to think outside the box some. You could easily use canvas and burlap in scrapbooking too. All pages do not have to be just paper. This past month, at The Scrapbooking Studio in Bloomington, IL, I was asked to design with Echo Park's So Happy Together line by Deena Rutter. This line is absolutely adorable and was a lot of fun to use. The colors are bright and cheery. 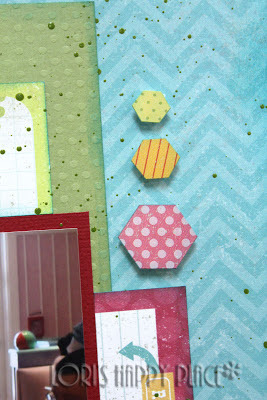 I loved the lime green and blue turquoise mixed with the fun raspberry and orange. The orange reminded me of the orange on a dreamsicle. I was excited to use my new Tim Holtz Alterations Bag Die that I got this month. 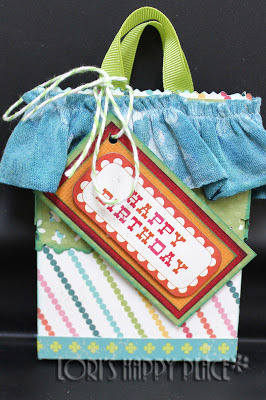 I knew that I wanted to use it and my Vagabond to make a cute bag. The bag is a great unique way to give a small gift like nail polish, jewelry, or maybe just a gift card. 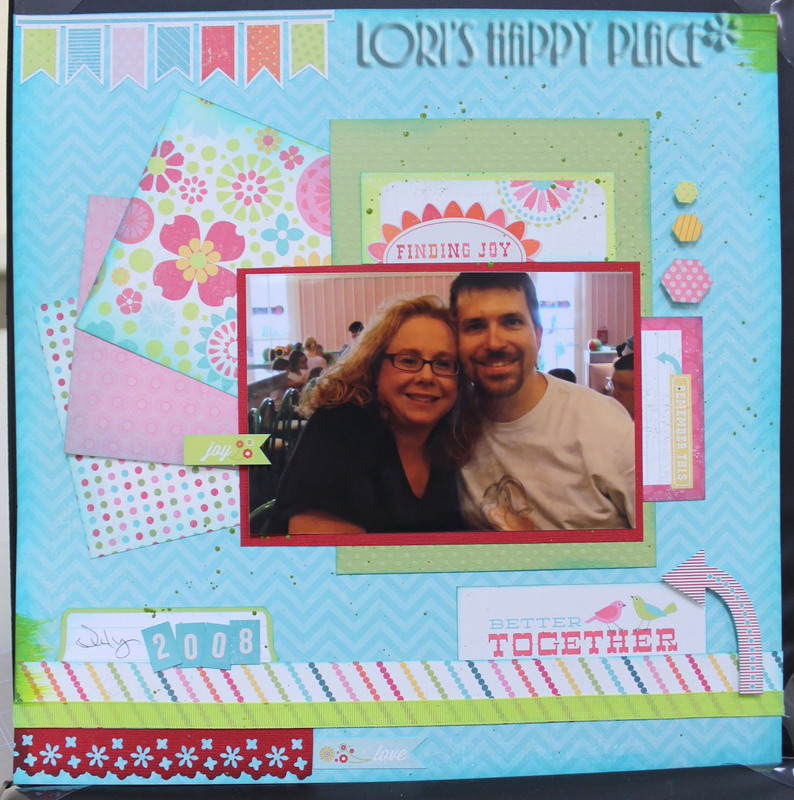 The next item I designed was a one page layout to showcase my favorite picture of the hubby and myself. Added a little Golden Green Gold Acrylic Paint to the corners with some additional splatters. 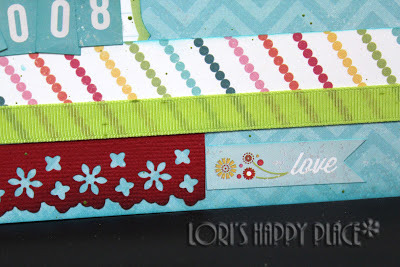 It coordinated great with the green from the So Happy Together line. 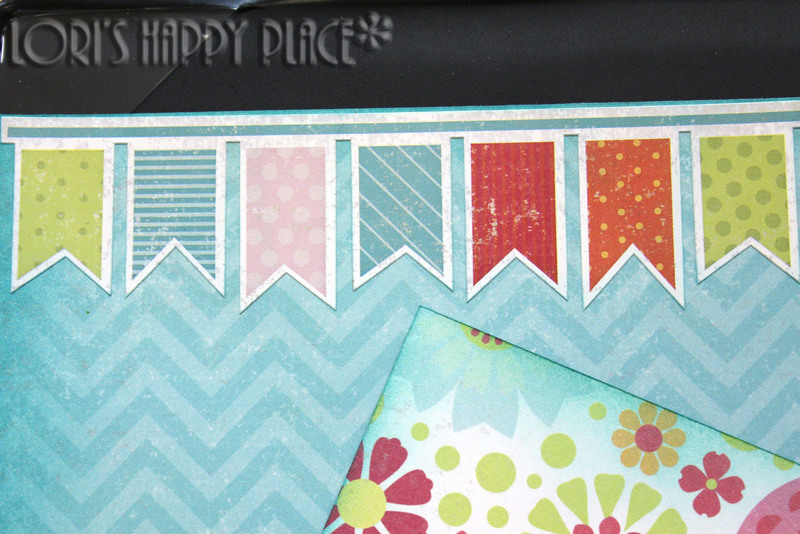 Fun splatters and So Happy Together stickers. I popped them off the page with some foam tape. 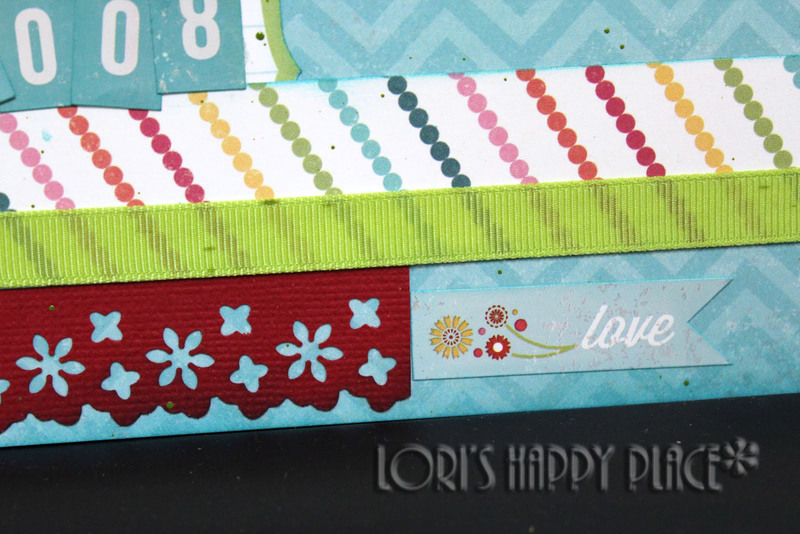 A little raspberry cardstock punched with a Tonic Studios edge punch. Banner stickers in the So Happy Together line. The next thing I designed was a canvas. I used Dyan Reaveley's Spray Inks and Time Holtz Distress Ink to modify the coloring on the Canvas Corp Canvas and the White flowers. A great spring/summer canvas to display in your home. The colors really pop!!! 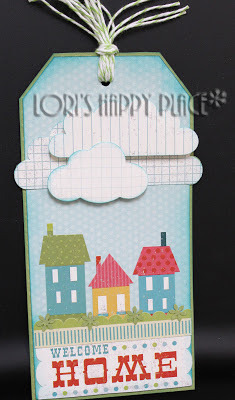 The last thing I designed was this adorable little tag. A great tag to add to a bottle of wine or to any Welcome Home gift. So fun!!! I added Divine Twine in lime to the tag to finish it off. Absolutely adorable. Can not wait to give this one on a gift to someone. Loved how the clouds looked all layered with foam tape.